It is time! The winter boots have been moved forward to the front row of my wardrobe. The sandals are safely tucked away at the back for when summer makes it’s appearance again next year. My Uggs have been gracing my feet pretty much every day for the last few weeks. My mum brought me a brand new pair for my birthday in August so I have been looking forward to wearing them. They are the same as my old pair, black naturally, but this time she bought me a leather pair in hope that they will be abit more hard wearing than the suede version. I love uggs. They really are the best things ever and worth every penny in my opinion. 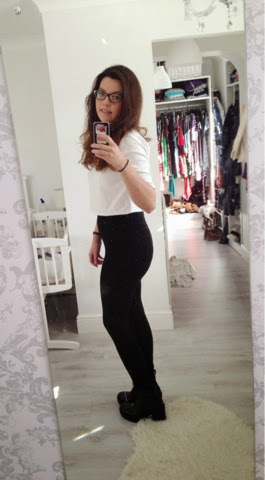 Anyway I digress, I shouldn’t really be talking about Uggs especially when I am not even wearing them in this outfit! :-s I was going somewhere with this, honest! When I am feeling abit posh or I’m not going out with my darling husband, because he has a secret vendetta against these boots (it’s not so secret, he makes it pretty clear that he does not like them every time I wear them!) I wear THESE! My beautiful vagabond boots. Oh how I love them. If boots were men I would marry these boots. Tall, dark, handsome and muscly. Perfection! They are the Vagabond Libby platform lace up ankle boots. You can buy them from most places, office, asos… I got mine from urban outfitters last christmas. These boots are high so make your legs look super long and lovely but the platform means they are not uncomfortable. I very rarely wear heels and as a result when I do they hurt my feet. I envy those hardened individuals who wear heels the size of sky scrapers every day. I am not, and have never been, one of you. Yet I can stomp around in these beauties all day without a care in the world. Winning! The jeggings are from h and m and were £12.99 if I remember rightly. I bought these when I was pregnant so have only just got round to wearing them. Let me tell you they.are.awesome! Super high waisted to cover my mum tum, slightly thicker and more jean like than my usual legging of choice but comfy all the same. I really like these and may need to purchase more of them. The top is from misguided. I ordered it as I find long crop tops so much easier to breast feed in as there isn’t as much material to bunch up. I’m not sure I actually like it. I thought it was cotton but It’s that horrible material that makes you sweat. The long sleeves also mean it’s quite restrictive but it does the job and so I’m keeping it. I also wore the cardigan of the moment. 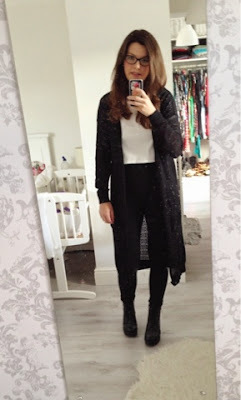 My longline, crochet like, cardigan from Primark. You’ve heard how much I love this before. My feelings haven’t changed. You know where to go if you want one too, I was in my favourite haunt last friday and they still had them in stock then.Ta ta!